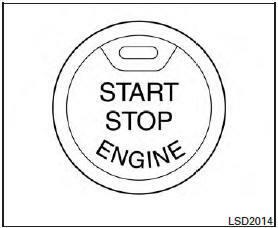 When the ignition switch is pushed without depressing the brake pedal, the ignition switch will illuminate. ● once to change to ACC. ● two times to change to ON. ● three times to return to OFF. The ignition lock is designed so that the ignition switch position cannot be switched to OFF until the shift lever is moved to the P (Park) position. 1. Move the shift lever into the P (Park) position. 2. Push the ignition switch. The ignition switch position will change to the ON position. 3. Push the ignition switch again to the OFF position. Some indicators and warnings for operation are displayed on the vehicle information display. See “Vehicle information display” in the “Instruments and controls” section of this manual.